E-books have some advantages over traditional books. They can be cheaper, or even free as there’s no paper or printing costs, and they can be easily distributed worldwide through the Internet. Now it’s possible to use smart phones, PDA’s and portable music players to read e-books, without buying an e-book device. If you are a digital activist, you can create and distribute your own books without a publisher without depending from publishers and book stores. File formats: pdf or Epub? PDF is a well known and well supported format, but .epub has other advantages. EPUB was created to display reflowable content, meaning that the text display can be optimized for the particular display device used by the reader. With the epub format, the same e-book will adapt it’s layout to be easily read from a mobile phone, e-book reader, notebook, laptop, or a desktop with a big screen. In devices with smaller screen sizes the book will have a higher number of pages. With PDF’s the user can only zoom and pan, but the pagination is always the same. Pdf is the best format to be viewed on large screens and epub is more adaptable to small screen sizes. Important note: This page is only about e-books in the .epub format. 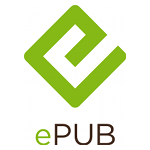 Epub is a completely open and free standard, created by the International Digital Publishing Forum, that is being adopted by major hardware manufacturers, like Apple. The main purpose of this page is to provide information for digital activists on how to publish their books in this format. It’s also a collaborative effort to present guidelines to anyone that is just starting to create his first e-book. It also assumes that the author wants to publish the book without charging readers, so it’s out of scope of this page DRM and financial aspects of e-book publishing. Calibre – Not just a reader, but also an e-book manager. Not very simple if you just want to read e-books, but effective to manage a small library. Browser plugins work in all operating systems. With web readers, the user can read the e-book online, and it’s not necessary to install any application or plugin. Bookworm – Upload and store your e-books on the web. There’s also e-book readers for Android, Blackberry, Symbian and Windows Mobile phones and other devices. If you want readers to have a good experience reading your e-book, then an automatic export is just the beginning of the porting process. Even the simplest text books need to be adapted manually and in some cases the book has to be redesigned for the small screen. On the other hand, most software can create bugs when exporting or converting from one file format to the other. This bugs may not be visible in some apps, but can be catastrophic in others. Always test your e-books in different apps and different screen sizes. The desktop publishing application Adobe InDesign can export to .epub. Calibre – Converts from other popular formats (i.e .odt (Open Office), html, pdf or rtf.) to .epub. eCub – Creates .epub books from xhtml files. 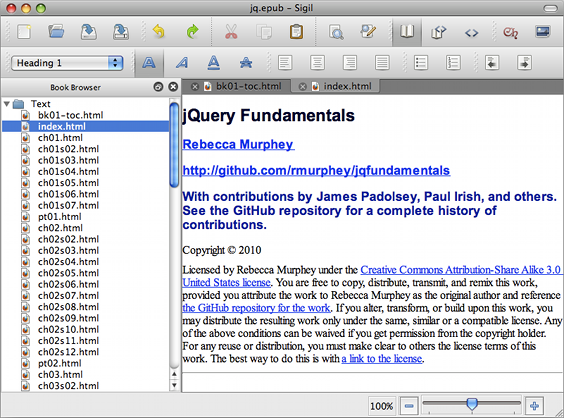 Sigil – Wysiwyg e-book editor. This application looks like a Word Processor, but it also allows manual editing of the html files. Easy to use and powerful at the same time. Epub files are just zip files with an .epub extension. Inside this files there’s xhtml, images, CSS and fonts. If you know how to edit this files you can enhance or just modify files created by wysiwyg editors or converters. After editing, don’t forget to validate your code. E-pub books can contain text, images, a formatted layout and and embed fonts. Online libraries that allow authors to publish their own books, like Feedbooks or Smashwords. Make it available also as a printable A4 Pdf. Many people prefer to read books printed on paper. Put a link to a page explaining how to read .epub books very close to the download link. Make sure you can count downloads easily. You will need side statistics that count requests to the .epub and .pdf files. If your e-book is a technical book and you plan to update it, ask readers their e-mail address, so you can warn them about new versions. Ask for feedback to your readers. For example you can ask them what content they would like to see in a new edition. This entry was posted in Articles and tagged Ebooks, Howtos. Bookmark the permalink. 3 Responses to "How to create an e-book in the .epub format"
You can produce ePub files easy using LibreOffice/OpenOffice just installing the extension Writer2ePub, altough it stilll has some glitches. I just like the valuable info you provide for your articles. I will bookmark your weblog and test again here regularly. I’m slightly sure I will be told many new stuff right here! Best of luck for the following! I love Stanza to creat my epub books for my iPad. It allows you to convert from a large variety of formats like MS LIT, Mobipocket, Kindle, RTF, PDF, MS Word, and many more into ePub.